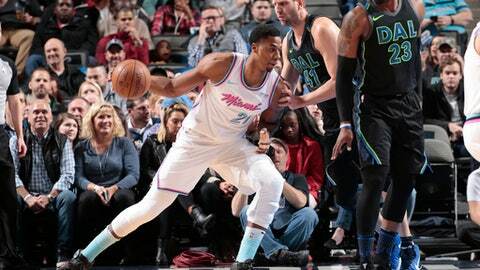 Whiteside scored 25 points with 14 rebounds in the Heat’s 95-88 victory Monday night, a day after the center and his coach spoke for about an hour. ”I sat on it, I slept on it, and I thought about it a whole lot,” Whiteside said. The Heat never trailed after Goran Dragic made a steal that led to Tyler Johnson’s tiebreaking 3-pointer to make it 38-35 with just under 4 1/2 minutes left in the first half. Their lead went to double digits again after Whiteside had consecutive baskets midway through the third quarter. Miami (29-21) led 51-41 when Josh Richardson hit a 3-pointer with 41 seconds left in the first half. But the Mavs trimmed that in half when rookie Dennis Smith Jr. made a defended buzzer-beating 3-pointer from about 27 feet to make it 51-46. James Johnson had a hand up in front of Smiths’ face with Whiteside coming from the side. Heat: Whiteside had his 18th double-double this season. … For the second game in a row, Miami won to complete a season sweep. The Heat beat Charlotte on Saturday night to wrap up a four-game series sweep. … The only team the Heat have swept more in the regular season is Sacramento at 15 times. Miami lost to the Kings already this season. Mavericks: Nowitzki has played 49,941 career minutes, 59 shy of becoming the sixth player in NBA history with 50,000. Elvin Hayes played exactly 50,000 minutes, and former Mavericks guard Jason Kidd is fourth on the list at 50,111. ”It’s a very staggering accomplishment and done with such grace and such little hype that it’s probably very much taken for granted,” coach Rick Carlisle said. … G J.J. Barea missed his second straight game because of a left oblique strain. … Devin Harris was back after missing four games because of a concussion and personal reasons. He was 1-of-7 shooting in 16 1/2 minutes. Richardson’s parents drove down from Oklahoma City to see the Heat and their son play. ”It’s always dope to see them in the crowd, see your parents sitting there and cheering you on because it doesn’t really happen as much in the NBA,” Richardson said.